So you want to bring a puppy into your house. You want to accept another living creature as part of the family. It’ll be lots of fun, easy, enjoyable. If this is your first puppy – ever – then you had better be prepared. Yes, it will be fun and enjoyable, for both of you, but it won’t be easy. Puppies are like children. They need love and attention and they need to be trained. The first two are easy, the last, the training, requires a lot of time, patience, understanding and compassion. Most important, don’t give up. Once you bring a puppy into your home, it’s like bringing a new baby home from the hospital. The puppy and the baby are yours for life and must feel loved, must feel like they belong – FOREVER! Too often people jump into the idea of having a puppy. Yes, they’re cute, especially when they do little tricks. But, after a few chewed shoes, piddles and pooh balls scattered here and there (not to mention the vomit), destroyed treasures like books, you may think twice about your decision and want to get rid of the puppy. Think about it. Seriously. Are you really that cruel? To welcome a living creature into your home as part of the family only to discard him or her a few days or weeks later? Adopting or purchasing a puppy is a big undertaking and must be done with commitment and compassion. With those two ingredients, you will eventually have your special dog, best friend forever. 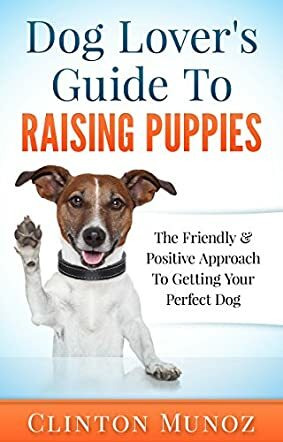 Clinton Munoz’s book, Dog Lover’s Guide To Raising Puppies: The Friendly & Positive Approach To Getting Your Perfect Dog, is the perfect guide to help you achieve your ultimate goal. With clear, precise details of training techniques as well as identifying the breed of dog that’s best for you, the author leads you through the difficult days of puppyhood. In the end, it’s worth it. But as Clinton points out, “Adopting a new puppy is very exciting and a true joy for the entire family. However, by welcoming this furry four-legged pet into your home, you have to realize that a great amount of responsibility comes along with it.” A very useful, informative guide.